The first egg robot was hatched when Bruce Shapiro in 1990 dreamed up the Eggbot™. Bruce published it as an open-source design for both software and hardware however the name is trademarked. While it is available for purchase as a whole machine, I wanted to see if I could 3D print one myself since the initial cost was large. … and that was about it. Most of those I had, the rest I could order easily (for example, I had Nema-17 steppers and this only required 28byj-48 ones, either 5V or 12V). So, in a fit of decision I launched into building it and surprised myself with how quickly it came together. The base and cover are easy to print with the sides of the cover bending into a living hinge. The ends are bolted shut and there is a sliding swing arm and end stanchion. The living hinge is an interesting design choice which leads me to believe that the designers were very familiar with 3D printing as it avoids overhangs in the upright sections of the print. It does make a very neat and attractive package when finished. The ‘tail stock’ – if this were a lathe – is based on a printed part with a 308zz bearing inside. The 308zz are a very common type of bearing, sometimes called ‘skateboard bearings’ as they are ubiquitously used for skateboard wheels. Once completed the whole machine is connected to a computer by USB cord and you use Inkscape to create and print the eggs. I have this collection of ties hanging behind my study door. A couple of observations: I don’t use them much anymore, and secondly – it doesn’t matter. Long before I left regular work I had noticed that men’s ‘uniform’ for business was changing. Gone were the suited-and-booted approach with winged-tipped oxfords, gone were the vests and suspenders, gone were the extensive range of ties worn every day to work (matched against colour, or themed to fit the sort of environment – oh, and always try to slightly outdress the customer since going the other way was a cardinal crime). Even one of the account execs with whom I worked remarked that they hardly ever put on a tie to visit a customer now, and they would have mixed with CEOs and financial industry heavyweights much of the time. So one of the things which I grew up understanding was needed to move into the world of work, then changed rapidly when the time came. Men’s ‘costumes’ always seemed out of kilter with working women’s ability to chose between a range of appropriate attire. While they could chose dresses and blouses, we chose suits. While they could include slacks or skirts, we chose suits. While they could wear cardigans or sweaters, we chose suits. Ties now seem limited to christenings, funerals and weddings. The “hatch them, match them, and dispatch them” mantra of the modern approach to ritual and ceremony. Beyond that, they seem consigned to the grave. I’ve started masking the base PCB of my WiFi doorbell and I am using both masking tape and Blutack. I discovered the Blutack while going through my stationery drawer looking for something similar to the latex masking fluid which is used in real electronic waterproofing. I had thought of using an eraser which would be soft and pressed onto the micro-USB port would mostly seal against the conformal spray. The Blutack is now my best friend for masking, even if the spray dissolves it some and leaves it sticky – but the easiest way to remove Blutack is using more Blutack, which worked very well on the PCB board. I decided to leave the camera alone as it was already in a unit, and previous experience has taught me that getting near lenses with any type of fluid or compound invariably means that you leave smears, no matter how careful. As it is a single unit I’ll seal around its seating and hope that that helps prevent major water ingress into the rest of the mechanism. If the video feed fails, I’ll know better next time! The speaker at the bottom is also hard to waterproof: cover it in conformal fluid or seal it in somehow would mean that it likely could not be heard, and similarly for the microphone which needs to vibrate to detect speaking. I’ll simply seal around the edges of those components and hope that their internals are okay with a little moisture. The door-press button is difficult, as it needs to move to trigger the micro-switch, but isn’t sealed around its edge – I assume that rain against the front of the unit seeps through capillary action around the edges and into the major internal space, and thence via condensation onto other surfaces. That’s bad, as it possibly means I cannot seal one of the areas of major ingress. Experimenting is fun, so I am going to try a thin film of plastic wrap (sometimes called ‘cling film’ here – other names elsewhere!) glued to the rear of the face plate to see if that works. The plastic film should bend enough to allow depressing the micro-switch, but the real challenge will be getting it sealed against the back of the face plate. I will try a rim of silicone sealant to which I will press a square of plastic film. Overall the task took me the whole day. While that seems a little crazy (and you may prefer watching box sets on television), I saw it as a learning exercise and bit of a challenge! I’ve thought through how to waterproof a very difficult piece of equipment and although the proof that it’s successful still remains, I am overall pleased with the result and would attempt something similar with greater skill. The doorbell does work now and I have tested it both via pressing the push button and the mobile app. Bring on the rain! I’ve been interested in getting a WiFi doorbell for my house. Having looked at the issues surrounding the two market-leading brands, decided to go the cheaper route and purchased a no-name brand from China. The doorbell and separate chime are excellent, but are not waterproof. I experienced this after having had the doorbell working for a week or so – England is anything but dry and before Christmas a downpour lashed our front elevation for around 18 hours, thoroughly wetting the outside of the unit. While the camera still worked and I could connect to it from my phone app, I did not suspect that water had entered the compartment. When it did occur to me was after one door press by the post delivery worker that left a lingering ‘ding dong’ in the air after it should have stopped. The next day the lingering ‘ding dong’ did not stop at all and I had to remove power from the chime unit. I opened the unit and saw moisture inside and dried it out, but realised several days later that I could not connect to the unit from the mobile app and so have taken it off the wall to fully waterproof it. Thankfully the ringing had stopped but I worried that it could re-occur in the middle of the night or while we were away. I will use electronic conformal liquid in a spray form to coat the PCB and internals, and will try to either glue non-moving parts in place with silicone sealant as well as putting a bead around the external rim of the back-plate. My challenge is that there is several holes where ingress is needed for the microphone and the speaker! How to waterproof those? And the press button will still have to move inwards to depress the micro-switch and if glued solid it could not do this. In the UK the major shopping district is colloquially called ‘the high street’. Other countries may call it the CBD (central business district – but more generally this is the office and skyscraper part of a city), downtown, or simply ‘the shops’. My local town here in the UK has one named The High Street and this isn’t unusual for England as it is the most common street name. With the advent of online shopping in the early 2000’s and the rise of Amazon there was much consternation at the plight of bricks-and-mortar shops on the high street. TV programmes that aimed to remedy the flight away (notably ones featuring Mary Portas – ‘queen of shops!’) were common, there were government grants and industry worked with academia to study the issues – I know, because in my professional life I took part in one such study. But the shoppers continued to flock to the online retailers and everyone was puzzled. Discounts, robo-shoppers (research online, shop in store without browsing), price matching and all manner of techniques were put forward. Card networks offered to analyse patterns and events were held in target towns. Yet, from my personal and anecdotal experience I’d have to point at one major reason why people are turning away from shopping in person especially at the larger out-of-town warehouses. I’ve just come back from picking up some items from one of the large chain store brands here in the UK and my experience was infuriating. I struggled to the checkout with a large TV and no-one offered to help, whilst the store was mainly empty with assistants wandering the aisles. We had a gaming console plus assorted other items and our purchases were a sizeable part of £1000 – so not insignificant. At the checkout the assistant immediately started up-selling product insurance and when I declined insisted on asking why? He also wanted to know my street address and email, and when I also refused those insisted that the purchase would not go through without them. Actually, the store already had them as I have an account in their online shopping system and had reserved the console earlier. But what shook me was the general abusive approach taken to the sale; countering my every decline, challenging my refusal to take insurance, insisting on more personal detail and so on. As we struggled to lift the items from the counter he stepped back and turned away – not even offering to hold them while I took some to the car. Perhaps it was just me, or a latent racism on their behalf – but this retailer as a whole has a ‘bad’ rating on Trustpilot with five-figure negative ratings. I felt unwanted and used. Recently another large out-of-town shopping warehouse has gone bankrupt and when I read forums on Toys-R-Us and their decline many people mentioned the shambolic store layouts and disinterested assistants. If shopping is all about experience, as many retail consultants believe, then it is important that shoppers feel great about what happens to them, not abused. I’ve spent long enough in the cut and thrust world of business and even time in retail as a IT consultant, so I understand the pressures and analytics which drive certain behaviours. Scanning time for checkout operators, forced meet-and-greet, up-sell and cross-sell all sound good on PowerPoint but in reality shoppers are looking to feel good and have an enjoyable experience, not just acquire goods out of necessity. I’d have to identify rudeness as a major reason why the in-store experience puts off many shoppers in England in the larger chain stores. Contrast this to a recent bookstore – surely an endangered breed if ever there was! – and the utterly other experience of an assistant looking people in the eye, asking how they were and did they enjoy that type of genre, wishing them well with their purchases and offering to go the extra mile and lookup stock if needed. You felt warm and appreciated and even though I seldom purchase physical books now, I have repeatedly gone to that store simply to browse. I felt good, I felt human, I felt wanted. 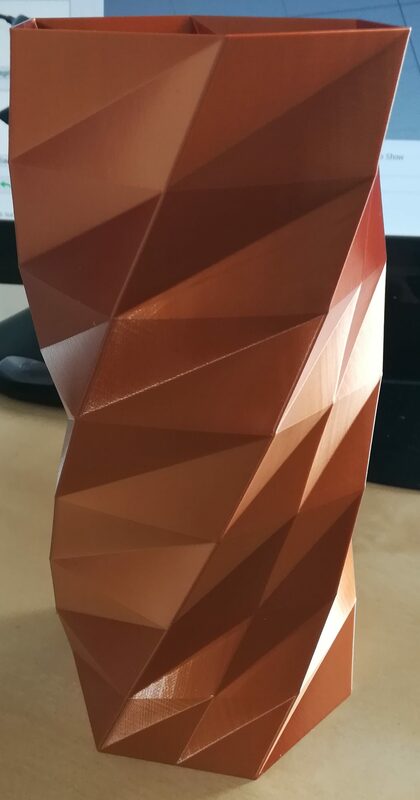 I’ve started printing 3D vases which look really nice in metal filaments. 3D prints are prepared by making the shape in software and then ‘slicing’ it into layers which can be understood by the printer. Usually this means that several layers are placed on the bottom, the side walls are built up by multiple passes of the print head, the top is a repeat of the bottom and the middle bits which are not seen are filled by ‘infill’ in special patterns. All this makes for strong objects. There is a special mode of slicing which ensures that the print head never lifts off the work being printed, and never ‘retracts’ the filament nor moves backwards. This is sometimes called ‘vase’ mode and makes the print into a long spiral all the way to the top. There are few objects for which this works properly since it makes the sides only one layer thick and there is no infill. On vases or drinking glasses, cups this is ideal however and with the proper sized nozzle and good filament the results are great. … or general spray paint coatings. Of these, the conformal coating sounds good but is very expensive. I’m going to try some of the other ones first to see if they are effective and attractive, starting with the cheapest which seems to be the wood glue and liquid latex. I wouldn’t want to mar the appearance of a beautiful vase by having a thick visible coating, but I also don’t want that vase to leak. I wish power cords and wall warts came with labels showing which things they were meant for; it’d save everyone a whole lot of headache! The roots of the word ‘mortgage’ mean something which is paid until complete. Some macabre definitions float around the internet including those which take the old French or Latin and read them in English, which is always a dodgy way to interpret languages. I saw ‘death-pledge’ being touted as one due to ‘mort’=death and ‘gage’=pledge, which sounds too simplistic. Different countries also have other expectations about how to finance buying a house – I was surprised to learn in Turkey that colleagues of mine there would take a loan from the property developer, and repay in a matter of years rather than decades. I’ve always lived in countries where the loans are taken through financial organisations and paid over decades with low interest rates that compound because of the extreme length of time involved. The process of removing this debt is called ‘redemption’ and is removal of the pledge-until-payment and release of the deeds which show title in ownership. While that is nice, it feels a little medieval and reminds me of the long history of land title and ownership. Real land reform is quite rare and has mixed outcomes, not always helping either the rural poor nor the lower classes. I do admire the land reforms in Scotland which include returning tracts of land to common or community ownership. It is nice as I redeem my own house to learn of the different ways that governments and rulers – some quite surprising – have redistributed land and tried to encourage greater wealth and ownership. I left work almost to the very day when I had lived equal time on two different continents. The first half was spent growing up in different parts of Australia, while the second half has been spent getting married, raising a family and working in England. Is this my half-time, or do I have another third still to come? I can look back at my early life with nostalgia, regrets, fond memories and laughter. The second seems to have been more of a grind, due perhaps to the efforts of raising a family and “doing time in the big city”. I didn’t enjoy work – not in the sense that I hated every minute of it and I had great colleagues and fun times, but the sense of purposefulness was missing. I really couldn’t see the point of it and the repetitiveness became a grind. It was remarkable to realise that my life changed radically at exactly the same amount of time from when the first had occurred, and it was a moment of serendipity for me. Personally I don’t have great ambitions nor aims for what happens next; perhaps it will be the the third season of my life, the autumn before the winter or perhaps it will be a new era of discovery. Whatever comes, it will examine it with interest.